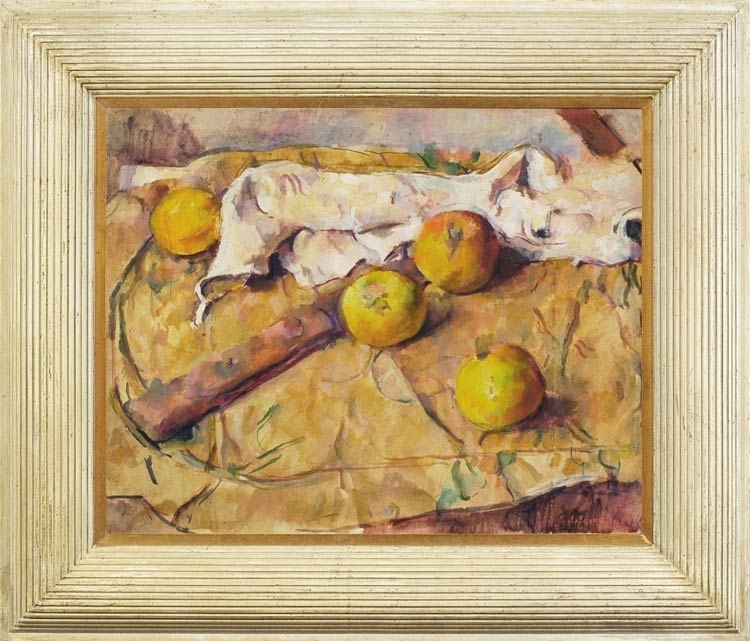 A beautiful study in colour harmony, this warm, autumnal still life is also an exercise in form and abstraction. It is influenced by Cézanne’s many paintings of apples (tossed onto pieces of rumpled cloth, piled into bowls and dishes, spilt around collections of jars and glasses, arranged in groups on a bare surface). We can see Weissbort, like Cézanne, seeking to establish the outline of each apple (that most elusive, artificial and man-made boundary, the contour), and setting the consequent shapes against the lines generated by the knife and by the folds of cloth, in a tension of form and geometry. Overlaying this complex structure is the choreography of colour and value inherent in fruit, cloth and ground.